The 2016 UK race season is fast approaching. It's time to finish with the mind numbing winter turbo sessions, and start building on those fundamental, long base miles. The problem is Jack Frost still thinks it's December! When I was racing full time, I had the luxury of choosing my daily training time, often based on the weather forecast. Avoiding freezing, early morning starts and when possible, heavy rain. Unfortunately, when it’s your job, you have to get out there regardless and face whatever elements Mother Nature throws at you. Being dressed for the occasion is very important, and often overlooked by many amateur cyclists. Now we all know how important looking good is! But with a vast array of cycling apparel and accessories on offer, there is no need to neglect performance for style. With current temperatures hovering around freezing, here is my list of what to wear to stay warm, comfortable and healthy until spring arrives. This is my current favourite item of clothing here at Planet X. The perfect jacket for winter conditions in a range of -5 to 10 degrees C.
The newly improved Echostorm 2 has a snug, warm fleece lined inner, with a technical wind and rain proof outer. Two of the key new features are the zippered, mesh-lined cuff openings, for ease of use with heavy winter gloves And the drawstring waistband for added comfort and custom fit. I would wear this jacket with just a long sleeve 365 base layer. 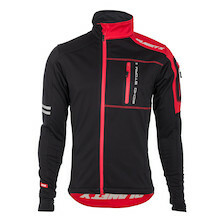 This jacket has everything you need for a long cold day in the saddle. 3 deep rear pockets to carry your food, rain cape, and a mini pump. Zippered chest pocket for the house keys. Sleeve pocket for your phone/MP3 player with built-in headphone cable hole and guide. Extra high collar and a Velcro, pull down splash flap to keep your bum dry. When it comes to dressing our lower half, I’m often amazed to see people’s choice of kit, or often a lack of. Cycling isn’t like football, where a ‘football kit’ is always made up of Shirt, shorts, and knee length socks! Cycling shorts are often seen to be a must if you are riding a bike. I’ve seen so many people out in the depths of winter wearing half a dozen top-layers and a pair of thin, lycra cycling shorts. STOP!! Keeping your legs warm is vital! Your muscles and tendons are key to your performance, comfort and can often be the cause of injury. During the winter months, bib tights are always the preferred choice. We have different levels of bib tight, for varying levels of warmth. My choice for foul conditions and the perfect compliment to the Echostorm 2 jacket are the new Windshield bib tights. Like most winter tights, the main body fabric is a warm brushed Roubaix fabric, which is both comfortable and stretchy allowing a great fit. This has been coupled with strategically positioned Windtex panels, on the knees, thighs, abdomen and lower back, to keep out even the strongest, coldest wind chill. Ankle zips allow for a snug fit, under or over your socks and overshoes. A foldable rain jacket is the most understated and most essential piece of kit you should own! I’ve had so many discussions with amateur and young riders over the years. It doesn’t need to be raining when you leave home, to need a rain jacket. I would NEVER leave home without one. Even in the summer in 35 degrees. Now this might seem crazy! But this is such a versatile piece of kit and not just to keep you dry from the rain. You never know if the weather might change! It’s an extra layer for a cold start, that can be folded up into your pocket when the temperature rises. Always stop and put a rain jacket on for long descents! We all love going abroad on early season training camps, getting carried away with the seemingly warm weather and beautifully challenging switchback climbs. This can and probably will be hard, sweaty work. So take a moment to cover yourself for the dive back down the chilly descent. Coffee stops and punctures: Even in the coldest temperatures, we do sweat during exercise. If you have a planned or non-planned stop during your ride, it's always best to throw on your rain jacket for 5 minutes to stay warm, and then put it back in your pocket, when you start moving again. Our new Hydrosphere jacket is the perfect all round rain jacket. Fully waterproof (18-20k mm) and highly breathable (18-20k MVP), means you could actually wear this rain jacket all day long and stay dry both on the inside and the outside- unless you're putting down max wattage efforts. Many rain jackets might keep you dry from the rain, but do not breathe sufficiently, meaning your sweat cannot escape and your clothes will eventually become cold and wet under your rain jacket. The Hydrosphere is waterproof enough to keep the rain out and breathable enough to let your sweat evaporate, helping you to stay warm and dry. The Hydrosphere is also lightweight and compact enough to fold up and pocket, should you need to remove it. Try them on for size, see how much you like them. 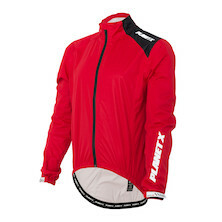 The Hydrosphere is the perfect jacket for wet, cold and windy rides. Combining a warm, windproof hardshell outer with a seam sealed waterproof inner has delivered a super versatile, all weather jacket that's as perfect for high intensity chain gang rides as it is for long steady days in the saddle.